I've never been one for a sweet tooth so I love cheesy biscuits. 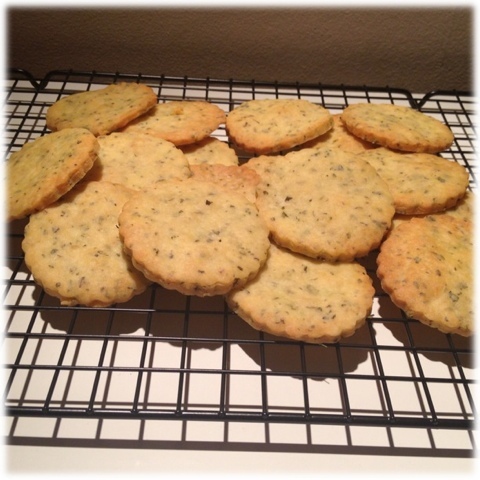 When I became gluten free I developed my own recipe for gluten free savoury biscuits. They are delicious on their own but also make a brilliant alternative to crackers and are fabulous with a dollop of chilli jam or tomato relish. One important note to make when baking these biscuits is that it is important that you use margarine, not butter. Using butter can change the taste and texture of the biscuits and produce an unsuccessful bake. If you want to use the same as me, I use Tesco's olive spread. You can adjust the types of herbs you use to your own taste, and also the ratios. I use a bit more oregano because I love it. These biscuits would also work really well with some finely chopped fresh rosemary. In a mixing bowl, rub the margarine and flour together until the mixture forms a breadcrumb-like texture. Add the Parmesan, salt and herbs then bring it all together with your hands until it forms a dense dough. Sprinkle a clean work surface with the extra flour and knead the dough for a brief moment until it is nice and smooth. Wrap it in cling film and leave to rest in the fridge for an hour. Preheat the oven to 190c and roll out the chilled dough between two sheets of baking parchment until about half a centimetre thick. Line a large baking tray with baking paper and grease very lightly with a very small amount of sunflower oil. Cut out small biscuits with a medium cutter and gently place on the lined baking tray then bake in the preheated oven for about 15 minutes until golden & slightly crisp. Can't stop making these! Everyone loves them. Amazing with onion relish. Thank you. I think rolled into sausages they'd make a good alternative to bread sticks. Mmm with a glass of wine.